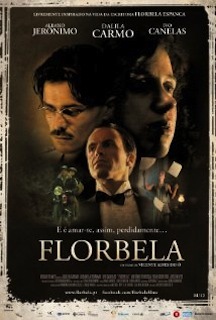 Review: “Florbela” was loosely based in the life of Portuguese poet Florbela Espanca, whose writings became symbols of love, eroticism and feminism. Filmed in Vila Viçosa, her hometown, and Lisbon, the film depicts the Portuguese 20’s by making use of an interesting cinematography that contrasts shadowy images with colorful tones of blue and yellow. The script just slightly mentions Florbela’s doubtful past, centering mostly on the peculiar relationship with her brother Apeles, for whom she had a special love, and with her patient husband Mário Lage. This trio of characters was very well performed by Dalila Carmo, Albano Jerónimo, and Ivo Canelas, who were capable to pass all the devouring jealousy and discomfort, on every interaction. The poet’s constant struggle was shown with clarity, when confronted with feelings, insecurity on writing, and in her search for recognition. I liked how the light was used to create intimate, warm images, along with the spirited, wordy dialogues. A couple of scenes, however, seemed utterly misplaced, as if coming from nowhere. Nothing really serious, in a movie that was never boring.